We heard our membership and delivered. 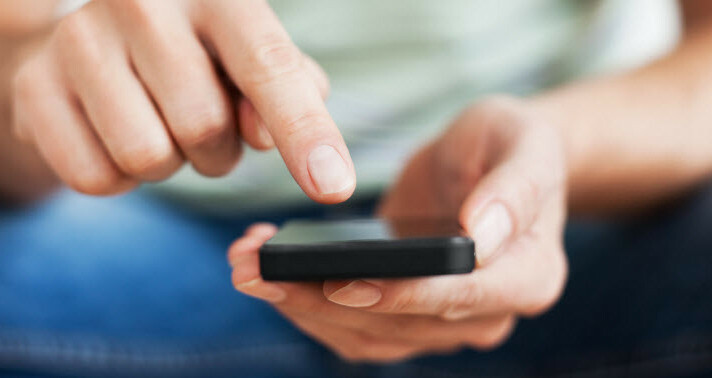 NCH’s website is now mobile friendly with smartphones, ipads, kindles and more. You can now enjoy our website while on-the-go! Receive up to 25% off when purchasing Homeopathy & Homeopathic Links is a combo bundle! Receive 20% off when purchasing them individually! 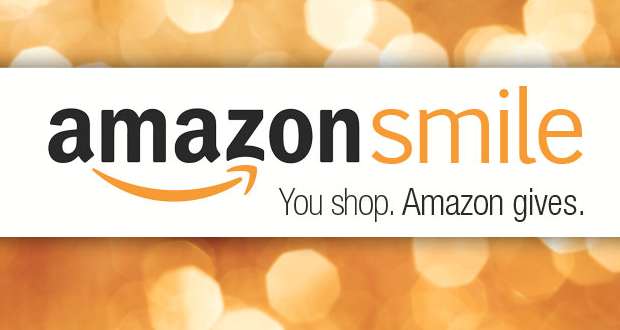 Please log into your account on our website and use the NCH store to purchase. Professional Members can submit events, seminars, conferences and more to info@homeopathycenter.org to have it posted to the NCH Calendar ! Dana Ullman's "Learning how to Use a Homeopathic Medicine Kit" is a free 40 video e-course for members. Contact info@homeopathycenter.org to receive more information! Are you interested in learning more about homeopathy in a group atmosphere with your peers? NCH is back with a rejuvenated approach for our Study Groups. For more information email info@homeopathycenter.org . 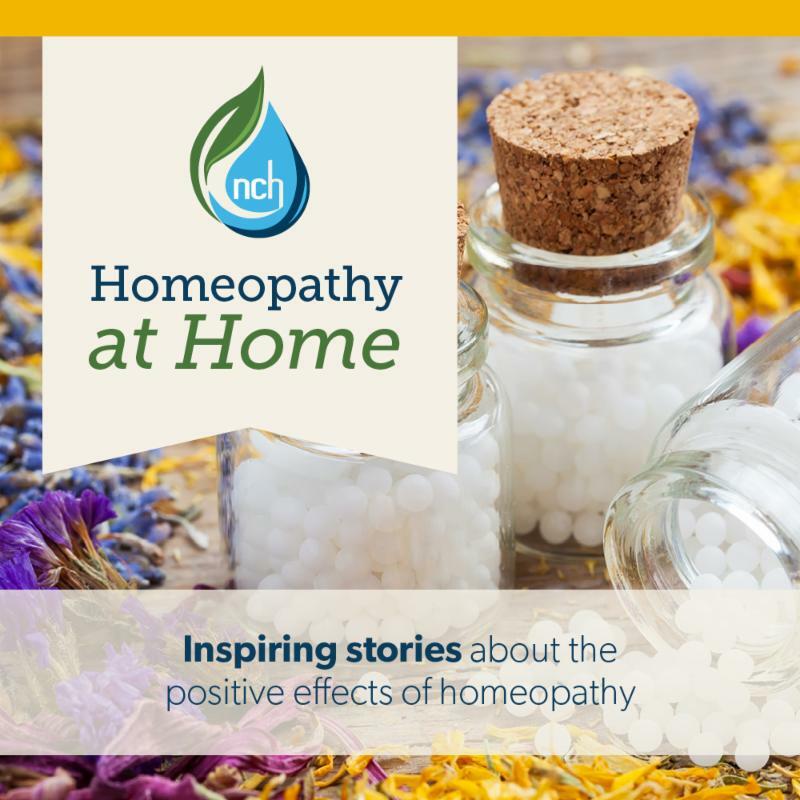 This article by NCH member Begabati (Burke) Lennihan is a comprehensive response to the NEJM article calling for tighter regulation of homeopathy and provides factual answers to longstanding regulatory and media bias issues. It was prepared before the current FDA draft guidance was released. Read article. We need your help in calling your Representative to join the new bipartisan Congressional effort and attend a Congressional Briefing on March 15, 2018. This Congressional Briefing, only a week away, will provide legislators and other policy and regulatory officials opportunity to understand how shifting focus in healthcare to prevention, health creation and health promotion can create cost savings while improving health outcomes for Americans. 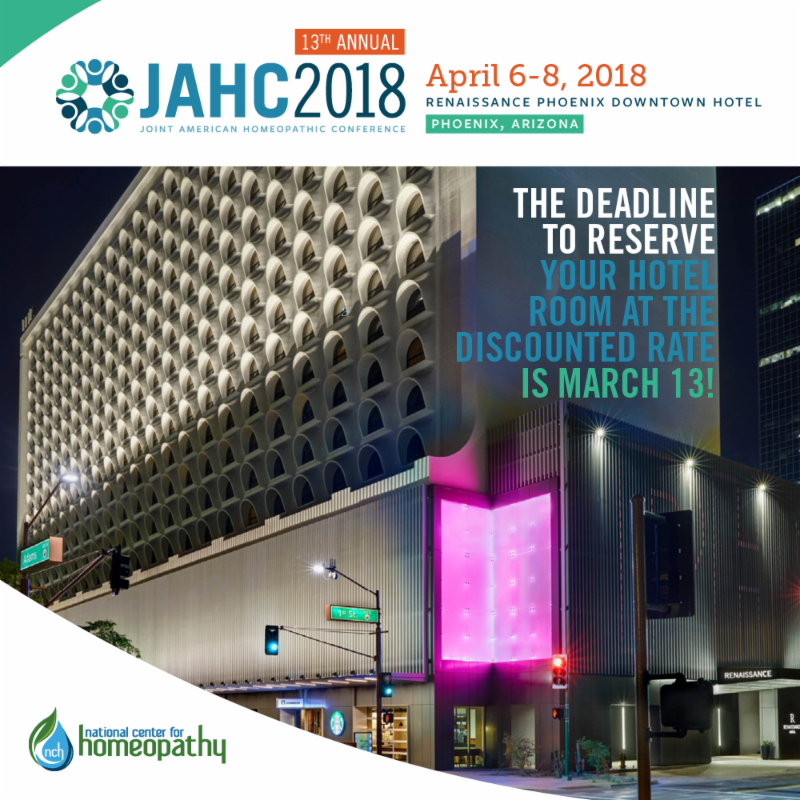 Did you know that there are discounted hotel rates available for #JAHC18 through March 13 ? Reserve your room now and be entered into a raffle to win a $100 gift card. Each event will include a Q&A session after the screening as well as goodie bags for all attendees. NCH is looking for volunteers to serve as Movie Captains for screenings of Just One Drop . We will help you promote your screening and send you goodie bags for your attendees! If you are interested in becoming a Movie Captain, please contact NCH at info@homeopathycenter.org . For over 30 years, Bio Essence Herbal Essentials has a provided a safe, high quality, and efficacious herbal product line to medical practitioners from our FDA inspected manufacturing facility in San Leandro, California. Our promise is to uphold the highest standards and to continuously enhance our services to help our customers build a successful business venture. Learn more. Boiron, the world leader in homeopathic medicines, is best known for its popular Arnicare® line of pain relievers and Oscillococcinum® flu reliever. Boiron maintains the highest standards in manufacturing, complying with U.S. Food and Drug Administration regulations, the Homeopathic Pharmacopoeia of the United States, and drug Good Manufacturing Practices. Learn more. Join renowned homeopath Kathleen Slonager as she illuminates women’s health and wellness through the use of Homeopathy. Homeopathy offers gentle, safe and effective care for all of the issues and transitions a woman experiences throughout her lifetime, which may include menstrual problems, pregnancy issues, with an emphasis on peri & pre-menopause, and menopause. 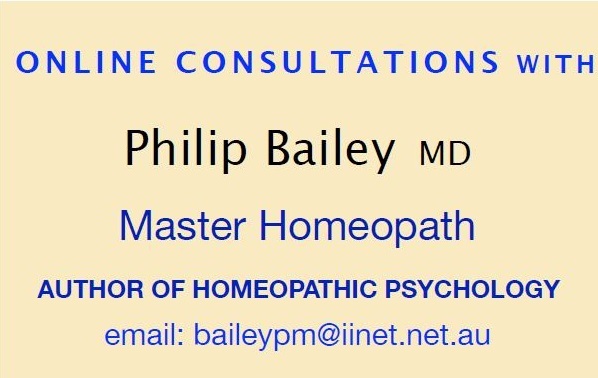 2018 AIH Conference - "Tackling Patients with Severe Pathology"
Homeopathy has been found to be effective in the great majority of patients suffering from infectious and autoimmune diseases. The limits of homeopathic treatment are encountered in the treatment of patients with Parkinson’s disease, ALS, and late-stage cancers. After finding a way to treat patients with Parkinson's disease with homeopathy, Dr. Saine began to apply this approach to cancer patients in stages III and IV. In this seminar, he will review case analysis, posology and case management for this cohort of patients. Our multi-day event will take place at the Hyatt Regency Cleveland at the Arcade from October 19th through the 21st, 2018. 1. Learning how to adapt posology in cases presenting serious pathology. 2. Learning how to properly follow patients with serious pathology. 3. Learning supportive treatments and regimens to enhance recovery in patients with serious pathology. 4. Learning how to use the laboratory to evaluate the progress of the patient and adjust the therapeutic regimen particularly in patients with cancer. Call for Immediate Action: To All Professional Practitioners of Classical Homeopathy/CHC Certificants Homeopathic Students, Consumers of Homeopathy in the U.S. Your support and action is needed now! A new bipartisan Congressional effort, led by Rep. Jared Polis, D-Colo., and Mike Coffman, R-Colo., will provide legislators and other policy and regulatory officials opportunity to understand how shifting focus in healthcare to prevention, health creation and health promotion can create cost savings while improving health outcomes for Americans. We need all members of Congress to support this important effort. Take action now and contact your elected Representative! It is as simple as visiting their website and filling out the information. A template letter is set forth there and all you need to do is fill out your contact information. The Inaugural Caucus will be held on Thursday, March 15 from 12-2pm at Rayburn Office Bldg. Rm. 2044. 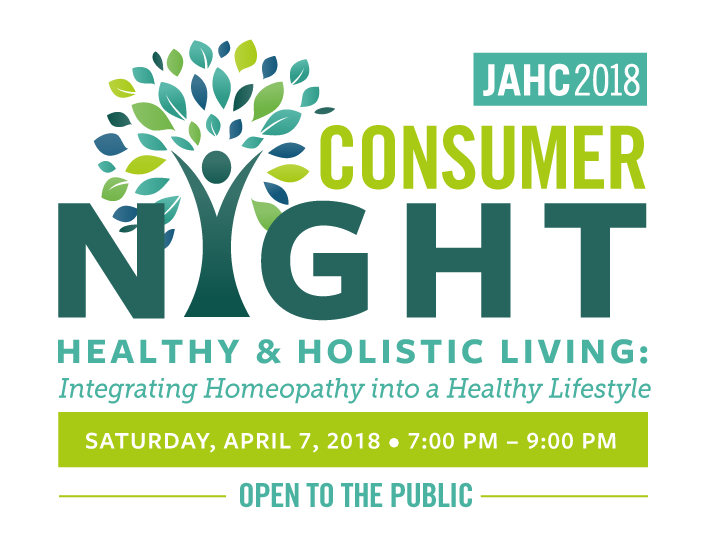 The CHC will have their advocate and consultant, Dr. Nancy Gahles, in attendance to educate and answer questions on the ICE accredited profession of homeopathy. The CHC believes Dr. Nancy's work is vital to our profession and to those who are CCH credentialed. Donate today to support funding for Dr. Nancy Gahles' representation at this important Inaugural Caucus. March is a milestone month for Haiti and Homeopaths Without Borders. The fourth and final session of HWB's Fundamentals of Homeopathy course will be held, with an expected 12 Haitian medical professionals receiving certificates of completion and homeopathic remedy kits. Like pebbles dropped in a pond, these new homeopaths will have a ripple effect as they take the hope and healing of homeopathy to their home areas. As an MD from southern Haiti commented, "Since our clinic was ruined by Hurricane Matthew, we now travel in the south doing mobile clinics. We have had no medicines, but now we have homeopathy!" Dr. Joseph Prosper remarked that "We now know these little pills can do so much for people. Once we graduate, we'll be all over the country!" We at HWB thank everyone who has helped make this possible. We invite you to stay abreast of our ongoing work at www.hwbna.org and https://facebook.com/hwbna and by following us on Twitter https://twitter.com/ HWBnaORG . So much more is just on the horizon! We will publish top-flight research and commentaries, while examining the impact of the WSR movement. The JACM Special Issue Editorial Team invites you to participate in creating this cornerstone resource to anchor and address this convergent interest in whole persons, whole practices, and whole systems. Read Full Submission Guidelines Here. If you are a current RSHom(NA), NASH could use your expertise! 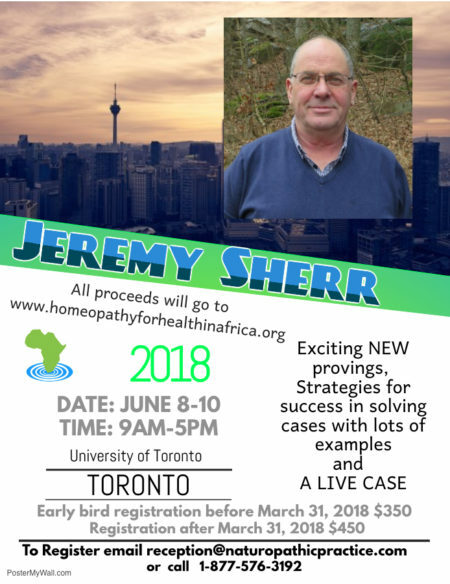 We are looking to expand our Board in order to continue working on NASH’s mission, which is to promote and represent professional homeopaths and to enhance the role of the homeopathic profession as an integral part of health care delivery in North America. A strong voice among other health care modalities. A powerful presence in society at all levels – social, health, political and legal. As the leading organization representing all professional homeopaths in North America, NASH is looking for new members for our all-volunteer Board to keep us moving forward. Please email us at nashinfo@homeopathy.org for more information.